Check our Real-Time Precipitation Network. We operate streamgages, observation wells, and monitoring stations that provide reliable scientific information needed to make informed decisions. We use advanced science and analytical methods to investigate and understand our natural world. Explore real-time Virginia and West Virginia streamflow, groundwater, and water-quality conditions and access data with our interactive map application. Hydrologic drought streamflow probabilities for summer months are provided as functions of streamflows during the previous winter months. This application allows the display and query of these drought streamflow probabilities for Virginia streams. 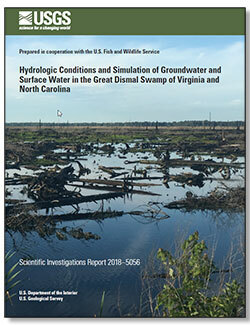 To learn more about USGS’ role providing science to decision makers before, during and after #Florence, visit the #USGS Hurricane Florence page at https://www.usgs.gov/florence. Editor's note: This story was originally published on Tuesday, Sept. 11 and was updated at noon on Wednesday, Sept. 12. 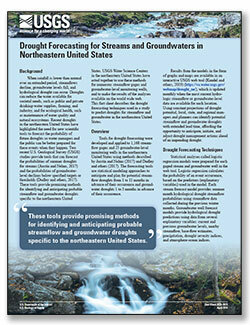 Austin, Samuel H.; Dudley, Robert W.
Austin, S.H., and Dudley, R.W., 2019, Drought forecasting for streams and groundwaters in northeastern United States: U.S. Geological Survey Fact Sheet 2019–3015, 4 p., https://doi.org/10.3133/fs20193015. Eggleston, Jack R.; Decker, Jeremy D.; Finkelstein, Jason S.; Wurster, Frederic C.; Misut, Paul E.; Sturtevant, Luke P.; Speiran, Gary K.
Eggleston J.R., Decker, J.D., Finkelstein, J.S., Wurster, F.C., Misut, P.E., Sturtevant, L.P., and Speiran, G.K., 2018, Hydrologic conditions and simulation of groundwater and surface water in the Great Dismal Swamp of Virginia and North Carolina: U.S. Geological Survey Scientific Investigations Report 2018-5056, 67 p., https://doi.org/10.3133/sir20185056. 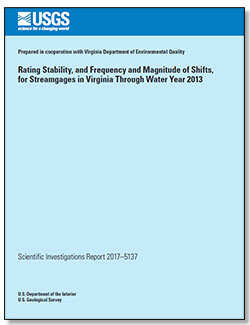 Messinger, Terence; Burgholzer, Robert W.
Messinger, T., and Burgholzer, R.W., 2018, Rating stability, and frequency and magnitude of shifts, for streamgages in Virginia through water year 2013: U.S. Geological Survey Scientific Investigations Report 2017–5137, 91 p., https://doi.org/10.3133/sir20175137.